Our standup Titanium jigheads have been especially designed for us and do exactly what their name suggests. 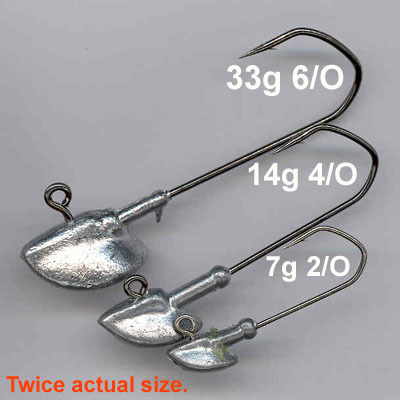 They make the Shad / bait standup on the bottom where other jigheads will roll over and lay down causing the hook to snag. So as you can see their benefits are twofold. They seriously reduce the risk of snagging by over 90% and present the bait perfectly. They were created by moving the weight further forward and further flattening the foot of the already widely used Eyrie Lake jig and are manufactured using VMC Barbarian hooks.